YouTube Channel 74XX Goes Live! It's time! I have decided to document some repairs as YouTube videos. The first will be a "Re-Repair", where I take a board I fixed, return it to non-working condition then describe my method live as I put it back together. Check it out 9PM EST on Thursday February 28! Kit includes board, headers, new Texas Instruments ICs and a tested (but most likely used) 6502A CPU. 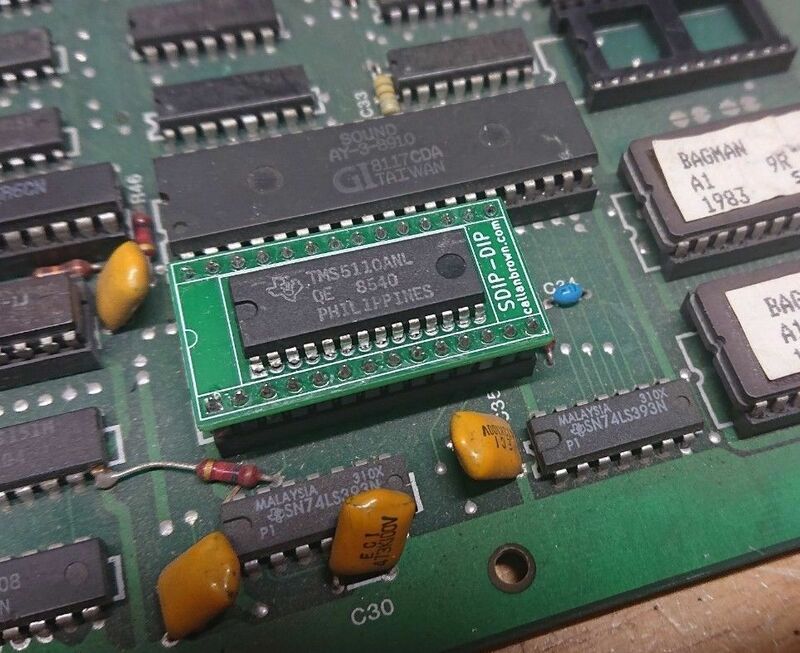 While repairing some Bagman boards I found that the TMS5110A was getting hard to find in a standard DIP package. Even those being sold as compatible showed up in this shrink-DIP format. So I had some adapters made! These are old stock TMS5110ANL chips in an SDIP package with a custom made SDIP-DIP adapter. This will fit into a standard sized 28-pin DIP socket like the original used on Bagman. These come preassembled (hand-soldered) with machined pin headers, which fit into the original socket (with a bit of force!). Each one will be tested in a Bagman before shipping.